.....dont climb a pole without it! Grading provides tangible feedback for you on your progress and give you something you can show off to your friends! It shows you are learning a recognised sport at a reputable school, which should help dispel some of the misconceptions your friends and family may hold. In order to unify standards, a universal grading cirteria has been developed. You may progress through five grading levels and have your achievement recognised by all PDC Approved Schools. If you move locations you will be able to continue your grading progression at any other PDC Approved School! You will graded according to criteria that have been decided democratically by all PDC Approved Schools. You will be provided with an official AAP book (your pole passport) in which your grading is recorded. 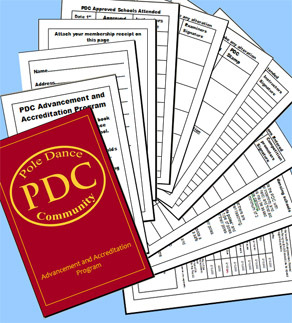 On request, the PDC can also provide you with a certificate of your success. Membership cost £30 which gets you 1 years membership of the Advancement and Accreditation Program (AAP). Free Syllabus CD-ROM (worth £22.50) with every AAP order in June.